Hoping to reverse what they see as years of deterioration, property owners in east downtown Anchorage have been quietly fixing up run-down homes, log cabins and businesses that extend for a few blocks up the hill from the Brother Francis Shelter and the jail. 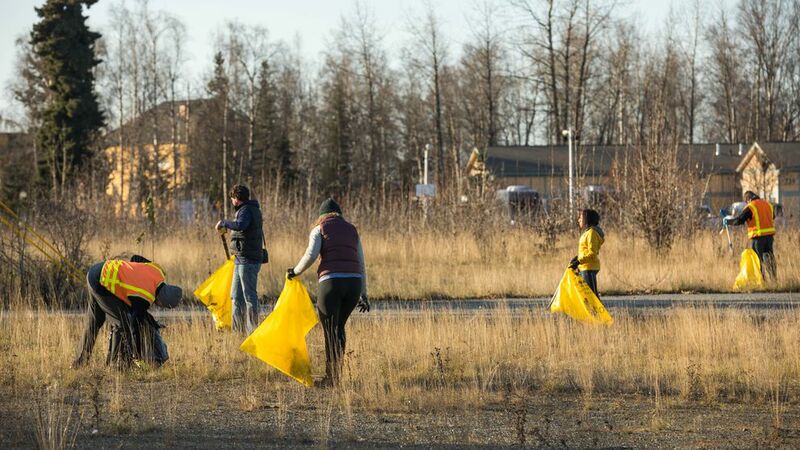 It's an effort that became more public and pointed last week, with a cleanup of the empty former site of the Alaska Native Medical Center on East Third Avenue. 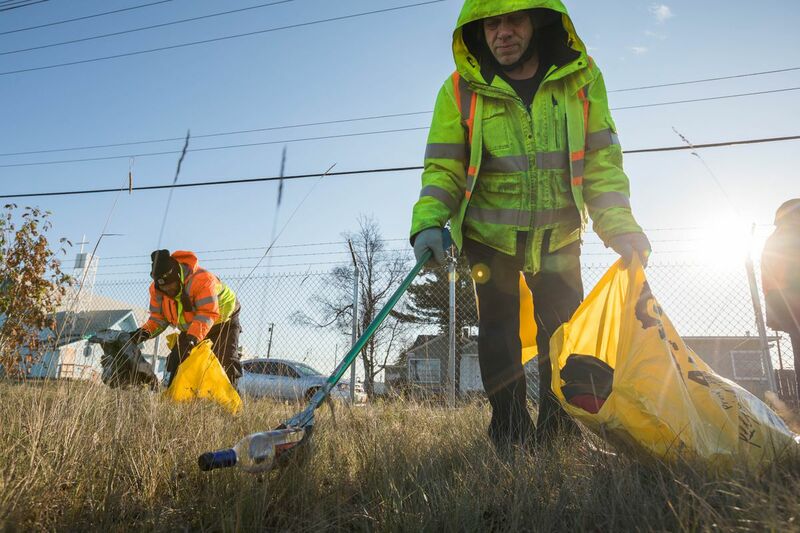 With city permission, a group of yellow-vested volunteers fanned out across the 15-acre stretch of land and loaded up trash bags. Most of the volunteers also own property right across the street. City officials weren't aware of a recent instance of a citizen group organizing a cleanup there. "Our basic theme here is, we believe in east downtown," said Jim Renkert, whose family owns three houses at the corner of East Third Avenue and Gambell Street. Renkert is part of a loose association of property and business owners called the East Downtown Action Group. More recently, an even more tight-knit group has formed to focus on a few blocks in the East Third Avenue area, which Renkert has jokingly called the "Third Avenue Radicals." The property owners feel the area has borne the brunt of the dysfunction that can spill over from the social services agencies and correctional facilities. In the 1970s, this was a vibrant area and a promising investment, Renkert said, when hotels were being built and the hospital was there. The hospital moved to the university medical district in the 1990s. Its old home has sat empty for years, fenced off and overgrown, about 15 acres on a bluff overlooking the Ship Creek industrial area. It's owned by the city and is being used as trailer storage. A few months ago, someone hung up a fake sign: "Coming Soon: Whole Foods." That sign brought attention to the area, as did a sign erected by property owner Rob Cupples about what he suspected was drug-dealing happening on his street. At the same time, real ideas have been swirling for the property, particularly the concept of an urban farm. 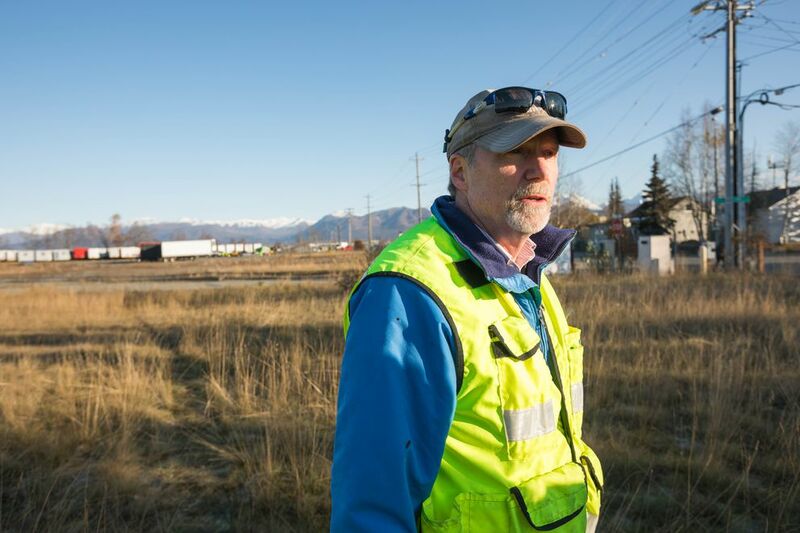 Downtown Assemblyman Chris Constant is one of the big proponents of the farm idea, and has enlisted the help of the Alaska Food Policy Council to draw up a plan. The property has some degree of contamination, and it's also in a seismic zone vulnerable to earthquakes, which affects what can be built there, said Nicole Jones-Vogel, land management officer for the Heritage Land Bank, the city agency that manages public real estate. Jones-Vogel said a federal grant to clean up blighted properties could be used to clean up the property, and the property is also the focus of discussions this fall around under-used public parcels in town. Jones-Vogel said the city is open to the urban farm idea. But there isn't yet a clear path forward, she said. In the meantime, Renkert and others said they want to kick-start discussions around the property — and help make it look nicer. On Friday afternoon, trash bags filled up with run-of-the-mill trash, like empty bottles, socks, pieces of wood, cigarette butts and plastic cups and lids. Someone picked up a dead cat. Jamie Boring, of the Downtown Partnership, found a shrew colony hunkered down under a wooden board by the fence. With the tall grass, it was hard to tell how much trash had actually been picked up. But Renkert said every little bit counts. Many property owners share the frustration of Ron Alleva of Grubstake Auction Co., and say the concentration of social services in the area have hurt the neighborhood. But where Alleva made noise, literally, last month by blasting train horns, sirens and emergency alarms to draw attention, Renkert advocates a more subtle approach. "We're focusing on the assets, we're fixing up our properties," Renkert said. Renkert's family owns three houses at the corner of East Third Avenue and Gambell Street, which they rent at market rates. The family tore down a fourth house that was dilapidated. Across the street, the federal government is trying to sell a foreclosed home. Further down, Rob Cupples and his family have owned property, including a duplex, since the 1950s. At the cleanup Friday, Cupples said he's been working in recent months to fix up his properties, and is slowly seeing signs of change, like new construction behind the church by the print and design shop. Renkert said his group isn't focused on solving the social problems in the area. But he said they do want to be involved in discussions about future development, and help take action. "Whiners and complainers need not show up," Renkert added.